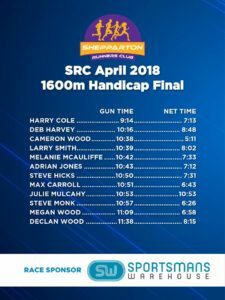 Congratulations to the winners of todays 1600m handicap event. 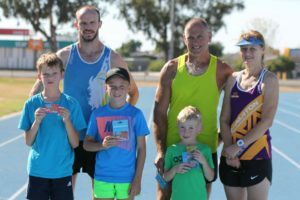 With 3 heats plus a final, it certainly proved an event for all ages. Pictured are the winners of the heats and the final. Top 4 in each heat went through to the final. The final was won by Harry Cole, little bloke pictured in the green shirt (what a little gun!!!). Second in the Final was Debbie Harvey, and Cameron Wood snuck in on the line for the third place. Declan Wood, Larry Smith and Max Carroll also won their heats. 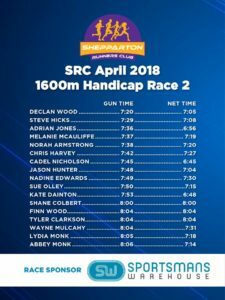 Congratulations to all participants, and a massive thank you to Sportsmans Warehouse for supporting the event. We really appreciate your sponsorship. I started running with my family and I really enjoyed it. This is my second year running. On Tuesday and Thursday I have football training or running training with SRC or both. I try and go to park run every week. I do some type of running every day. I want to get under 23 minutes for the 5km and keep working on my track events. Learning how to pace myself was hard, but Rob has helped me heaps with that. I did my first 10km earlier this year and I was worried that I wouldn’t be able to do as well as I expected, but it went really well. The Shepparton Lake where we do park run. Jeffrey Riseley, because he never gives up. To run my own race. I really love running and I am going to try and keep getting better and faster. 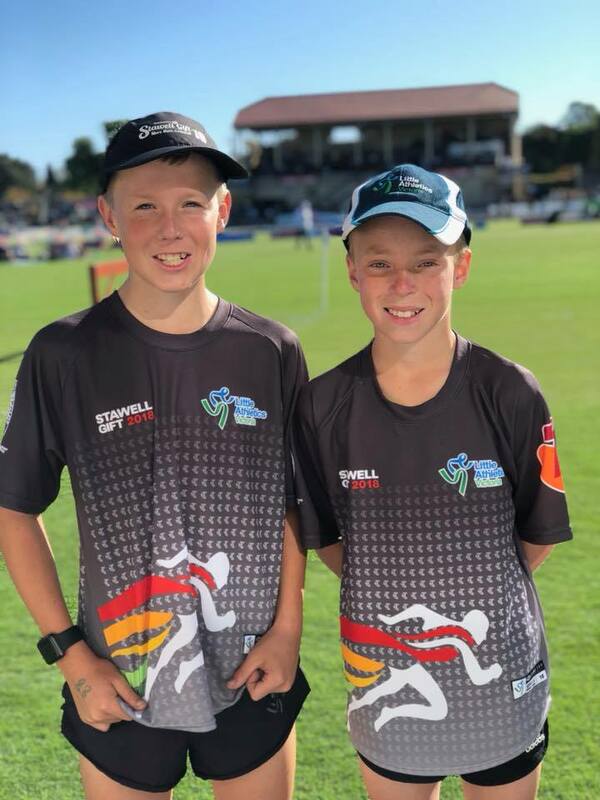 Now’s the time to grab your running buddies and enter the Shepparton Running Festival. Our Early Bird pricing finishes this Sunday 15 April at midnight. There are five events to choose from; Marathon, Half marathon, 10km, 5km and 2km. NEW…Team up for the Marathon! 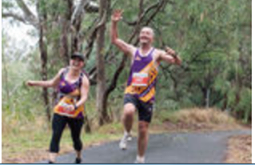 Would you like to taste the excitement of a marathon but share the effort and cost with your running buddies? Our marathon course is 3 x 14km loops so you can enter as a RELAY team. Psst…. price rise this Sunday so now’s the time to team up! Congratulations Kathy Fuller and Narelle Pell. The movie night has SOLD OUT. We are all looking forward to a fantastic night out. Monday, April 23, Cinema 1, 6:30 for a 7:00 pm start and afterwards at the Aussie Hotel. In need of some running inspiration? Then let the amazing sportsmanship of our Commonwealth Games athletes motivate you. 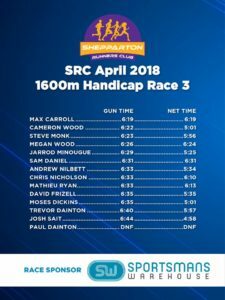 Dedication, sacrifice and sportsmanship has very much been on show this last week, with some admirable performances in the men’s 5,000m and women’s 10,000m events. Where are you on the Running Lifeline? Ever wondered how long it will be before you hang up your running shoes? Knightswood House has developed a handy tool to help you figure it out! Not only will it help you identify which stage at the lifeline you are at, but it also helps you get a clear vision on your big dream and what it’d take to make it a reality. Find out where you are! Running and in particular marathon participation has been enjoying a boom for several years now, and is arguably the biggest growth sport of the last decade. The US shows a 30% increase in marathon finishers in past 10 years . China has the fastest growth in marathons & recreational runners with growth in marathon races from less than 10 marathons to over 500 per year in the past 10 years. Both China & the US have over 500,000 marathon finishers in recent years, whilst Australia had early 25,000 finishers in 2017. Women’s participation globally is up 27% (men’s by 8%), on average women make up only 30% of marathoners. By comparison, our Melbourne Marathon has been Australia’s biggest marathon since 2013 when 8066 entries produced 6820 finishers. 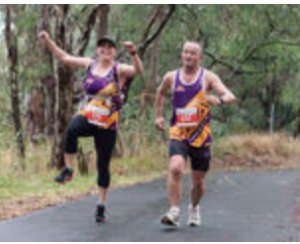 Tara Callingham & Steven Trevaskis trying to synchronise a jump during the Albury half marathon.